Brand new direct from Chris Reeve Knives this Large Sebenza 21 is outfitted with Silver hardware and Double Thumb Lugs. The size, shape and build of the Sebenza 21 is proven and continues to be one of the most relied upon pocket knives in America. 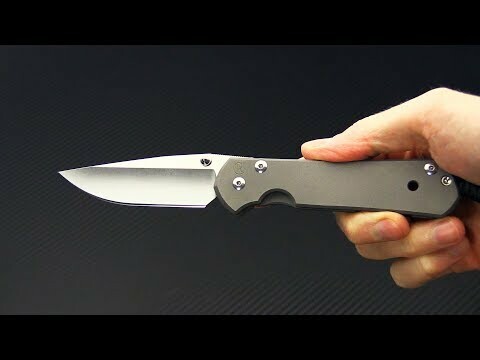 The Blade: The Large version gives its user 3.5 inches of polished, shaving sharp cutting edge built from premium CPM-S35VN steel. This steel is tough, wear resistant and relatively easy to re-sharpen and maintain. It is hollow ground for supreme sharpness and fully stonewashed to hide daily use. A thumb ramp on the spine has perfect jimping, nearly an inch and perfect placement. The rest of the spine is crowned, smooth and polished. This version features dual or double silver thumb lug openers allowing the user to open the blade from either side. It operates on a pivot system using oversized bronze washers with grease-filled pockets for smooth, no friction operation. Lock up is always solid and reliable. The Handle: Two thick slabs of titanium feature chamfered edges for a smooth, comfortable grip. Forward cutouts allow the user access to the frame locking mechanism and a comfortable place for fingers to rest. Both pieces are entirely sandblasted creating a matte grey appearance with very fine texturing. The grip is welcoming in the majority of medium to large hands. The Integral Frame Lock was created by Mr. Chris Reeve and continues to be a staple in the knife making industry. It's reliable, easy to use and virtually maintenance free. All silver titanium hardware on this Sebenza including a silver barrel spacer and lanyard-attached spacer at the end. A titanium pocket clip is attached to the back for tip up right hand carry. It can be easily removed with the supplied Allen wrench. Also included is a single tube of fluorinated grease, microfiber cloth and information packet. The Large Sebenza 21 knife from Chris Reeve is simple, effective and will last a lifetime.